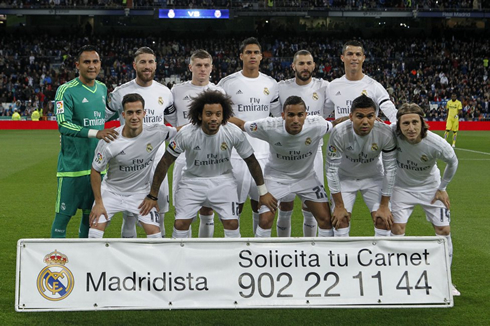 ﻿ Real Madrid 3-0 Villarreal. Still in the fight! 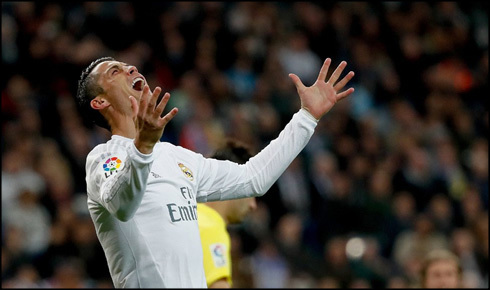 20.04.2016 » Real Madrid 3-0 Villarreal. Still in the fight! Real Madrid hosted and beat Villarreal 3-0 this Wednesday night at the Bernabéu, with Karim Benzema, Lucas Vázquez and Luka Modric scoring the goals for the Merengues. On the top league, everything remains the same since Barcelona and Atletico also won their games. Real Madrid defeated Villarreal 3-0 at home tonight, but nothing changed on the top of the league. Zinedine Zidane's men had no trouble in marking their superiority against the "yellow submarine", thanks to Benzema's opener in the first half-half and successful strikes from Lucas Vázquez and Luka Modric in the second. Madrid's rivals Barcelona and Atletico didn't slip up this time around, with the Blaugrana beating Deportivo 8-0 away from home and Atletico earning a tough 1-0 victory in San Mamés. There are now only 4 games left in the league and the margin for error is virtually nonexistent. The scare of the night came in near the end of the game at the Bernabéu, when Cristiano Ronaldo had a big fall and left the pitch holding his thigh. It shouldn't be anything very serious, but the club should issue a statement about Ronaldo's condition during this Thursday. Surrending is not an option for Real Madrid. The Merengues found themselves 12 points behind the league leaders Barcelona just a few weeks ago, but they're now only 1 point adrift and they'll keep chasing their rivals hoping for one last slip. Tonight, Madrid beat Villarreal 3-0 and made sure they will keep the pressure on Atletico and Barça for the upcoming weekend. With a massive clash against Manchester City scheduled for next week, Zidane already rotated a few of his players tonight, giving an opportunity to players like Danilo and Lucas Vázquez. Next Saturday against Rayo Vallecano, we can expect more rotations and 2 or 3 more players to be rested. Looking at tonight's game, there were plenty of positive signs shown from the players selected by Zidane. The former Tottenham star Luka Modric, was immense all over the pitch. The Croatian is one of Madrid's players in great form at this final stage of the season and that has to be great news. Villarreal's resistance lasted almost until the half-time break, but the Merengues would eventually find a breach in the visitors' defence in the 41st minute, when a good Cristiano Ronaldo initiative on the left led to a poor clearance from Sergio Asenjo. Waiting for the mistake was Karim Benzema, who was basically on the right place at the right time and reacted fast to the play for an easy empty net finish with his head. Real Madrid had the game under control throughout the whole night but their second goal still took them 69 minutes to score. It would be Lucas Vázquez's turn to shine now, with the Canterano proving his true value in front of Madrid's home fans after a great play on the right. The 24-year old only saw his right-foot strike stopping at the back of the net and scored his 3rd goal in the league season, the exact same amount of goals he had scored in last year's campaign. The deal got sealed shortly after, in a play where Danilo explored the right wing with his speed and pace, just before putting in a great cross aiming to the heart of the box. The ball fell behind Cristiano Ronaldo's area of action, but Luka Modric made the most of that space created by the Portuguese forward and finished it off with a beautiful left-foot strike. 3-0 to Madrid and Modric celebrated his 2nd goal of the season in La Liga. Real Madrid lives to fight another day and the next chapter of La Liga's title race is right next weekend, with the Merengues visiting Rayo Vallecano, Barcelona hosting Sporting Gijón and Atletico playing Malaga at the Calderón. Attackers: Lucas Vázquez, Cristiano Ronaldo, Benzema. 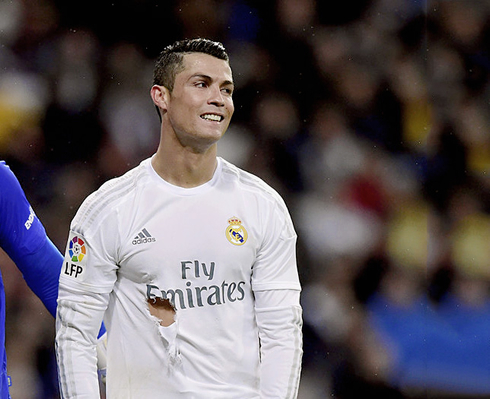 Cristiano Ronaldo next game with Real Madrid for La Liga is on April 23 of 2016, against Rayo Vallecano. You can watch Juventus live stream, Rayo Vallecano vs Real Madrid, Barcelona vs Sporting Gijon, Everton vs Manchester United, Arsenal vs WBA, and Liverpool vs Newcastle, all matches provided from our socccer live game pages.